Hialeah, FL. (Mar. 4, 2018) – Florida National University Men’s Baseball team played a 4 games series vs. Stratford University at home this weekend. The Conquistadors swept Stratford University making their record 6-9. Top of the 1st, Austin Elled walked; Jordan Carte scored on a wild pitch 1-0. Top of the 1st, Austin Elled scored on a wild pitch 2-0. Bottom of the 1st, Henry Perez singled through the left side, 2RBI: Luis Torres advanced to third: Benjamin Murray scored: Manuel Blanco scored 2-2. Bottom of the 1st, Henry Perez advanced to second on a wild pitch: Luis Torres scored on a wild pitch, unearned 2-3. Botton of the 1st Ezequiel Valdez singled through the right side, RBI Henry Perez scored 2-4. Bottom of the 2nd, Sergio Rivas scored on a wild pitch 2-5. Bottom of the 2nd, Stephan G Perez singled to right field, 2 RBI: Benjamin Murray scored: Manuel Blanco scored 2-7. Bottom of the 4th, Benjamin Murray tripled to right center, RBI: Manuel Blanco scored 2-8. Bottom of the 4th, Stephan G Perez singled up the middle, RBI: Benjamin Murray scored 2-9. Bottom of the 4th, Ezequiel Valdez doubled, 2 RBI; Jaymark Garcia scored: Lusi Torres scored 2-10. Bottom of the 4th, Melwing Rodriguez doubled, RBI; Ezequiel Valdez scored 2-11. Bottom of the 6th, Ezequiel Valdez singled through the right side, RBI; Jaymark Garica scored 2-12. Bottom of the 6th, Andy Garcia singled to pitcher, RBI; Ezequiel Valdez scored 2-13. Top of the 7th, Mark Copenha singled through the left side, RBI; Jordan Lowe advanced to second: Jorge Hernan scored 4-13. Top of the 2nd Luis Cintron grounded out to ss, RBI; Mark Copenha scored, unearned 1-0. Top of the 5th, Austin Elled singled, advanced to second on the throw, RBI; Luis Clinton scored 2-0. Bottom of the 6th, Henry Perez singled to center field, RBI; Benjamin scored 2-2. Bottom of the 9th, Benjamin Murray flew out to rf, RBI; Manual Blanco advanced to second; Yazir Braafhart advanced to third; J Perez 3-2. Top of the 1st, Jorge Herman singled, 2 RBI; Austin Elld scored; Jordan Carte scored. Bottom of the second, Sergio Rivas hit by pitch, RBI Luis Torres advanced to second; Jaymark Garcia advanced to third; Ezequiel Valdez scored 2-1. Bottom of the 3rd, Ezequiel Valdez reached on a fielders choice, RBI; Henry “Perez out at second 2b to ss; Benjamin Murray scored 2-2. Bottom of the third, Jaymark Garcia singled through the left side, RBI; Ezequiel Valdez 2-3. Bottom of the 5th, Jaymark Garcia grounded out to 1b unassisted, RBI; Henry Perez advanced to second; Brandon Torres scored 2-4. Bottom of the 5th, Brandon Perdomo singled to center field, RBI; Henry Perez scored 2-5. Top of the 6th, Justin Smith grounded out to ss, RBI; Austin Elld scored 3-5. 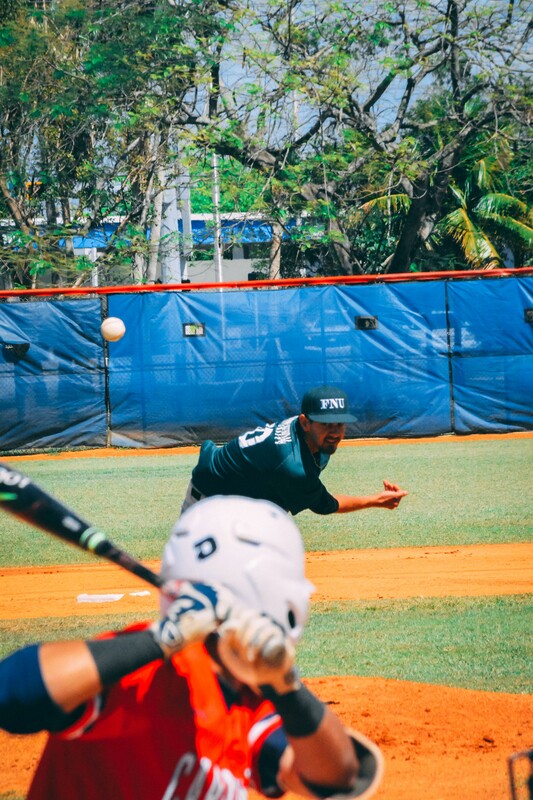 FNU Conquistadors started off this game strong with a 4-0 lead. Runs were by Jaymark Garcia, Luis Torres, Henry Perez and Ezequiel Valdez. Top of the 2nd inning began with a run by Stratford by Daniel Nevin. The 3rd inning stayed very quiet and then in the top of the 4th inning, Jorge Heernan scored for Stratford making the score 2-4. Sergio Rivas and Simon Dalmau scored for the Conquistadors in the bottom of the 4th inning. What is next for the Conquistadores? Your Conquistadors will be back in action March 6th against local rivals Florida Memorial University 3:00 p.m.